CENSE (the Coalition of Eastside Neighborhoods for Sensible Energy) is an all-volunteer, grassroots organization that represents thousands of Eastside residents and business owners. Our goal is to be the voice of the community and to ensure that important questions about PSE’s project are answered. 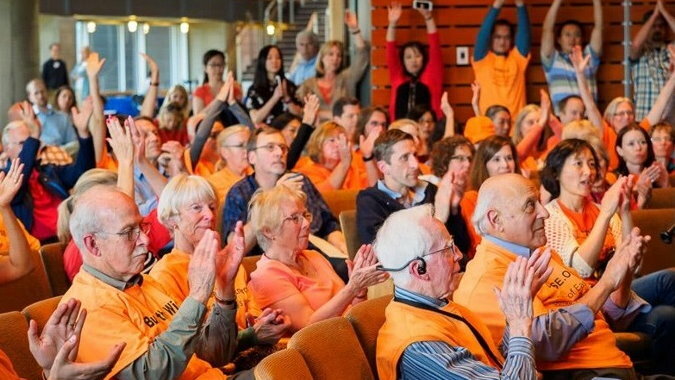 We come from many backgrounds, but we all agree that PSE’s “Energize Eastside” is a fundamentally flawed project. We have serious concerns about the need, safety, cost and environmental impacts of the 230kV transmission line project, and know that there are better solutions to our energy needs. CENSE is a 100% volunteer, non-profit organization with members in all four Eastside cities that would be impacted by PSE’s Energize Eastside Project. CENSE was organized in May 2014, after PSE attempted to use its Community Advisory Group, (CAG) to pit neighborhoods against each other as transmission line routes were debated. Our name, Coalition of Eastside Neighborhoods for Sensible Energy (CENSE), reflects the neighborhoods’ desire to work together on energy solutions that benefit our communities and the environment. CENSE has worked diligently to show that the assumptions PSE made to justify the need for this project are either outdated or misrepresented. CENSE has also promoted alternative solutions such as smart grid and battery storage technologies. CENSE is preparing for victory. We ask for your financial support so we can hire experts and legal representation for crucial hearings in 2019. Thanks to generous donations, CENSE has continued to build its legal strategy with our land use attorney, Rick Aramburu, and retain industry experts to prepare evidence for the hearings. We have a strong legal case based on City of Bellevue land use codes. CENSE convinced PSE’s state regulator, the Washington Utilities and Transportation Commission, to require PSE to document transmission projects in long-range plans. We also encouraged the Commission to require PSE to analyze energy storage, such as batteries, as an alternative for all transmission projects. CENSE joined with Sierra Club, 350 Eastside, and Protectors of the Salish Sea to rally and provide testimony aimed at closing PSE’s polluting coal plants, which provide about a third of the electricity consumed on the Eastside. PSE finally agreed! Our partner organizations support our fight for more environmentally sound solutions for the Eastside. CENSE hired energy experts to submit papers documenting the inadequacies of the Environmental Impact Study (EIS) and engaged hundreds of residents to submit written comments or testify at public hearings on the EIS. 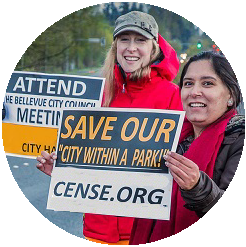 CENSE convinced the City of Bellevue to hire an independent analyst to study the need for Energize Eastside. The analyst failed to answer some of our pressing questions about demand forecasts, but there was one very important conclusion. PSE assumes that a huge amount of electricity must be exported to Canada in the middle of an emergency scenario on the Eastside. The analyst showed that this assumption, which we believe is not required, causes almost all of the overloads that PSE uses to justify the project. Three out of four CENSE-endorsed candidates were victorious in 2017 city council elections. We are gradually changing the composition of the city councils that will make the final decisions on construction permits for PSE’s transmission projects. CENSE engaged Richard Lauckhart, a former VP of Power Planning at PSE, to run advanced computer simulations of the scenario PSE uses to justify Energize Eastside. These simulations show that PSE’s blackout scenario cannot happen because of limitations on the regional grid.